Pawan Hans Limited Notification is out. Pawan Hans Limited is recruiting for 10 Cadet Pilot Scheme Post Posts. 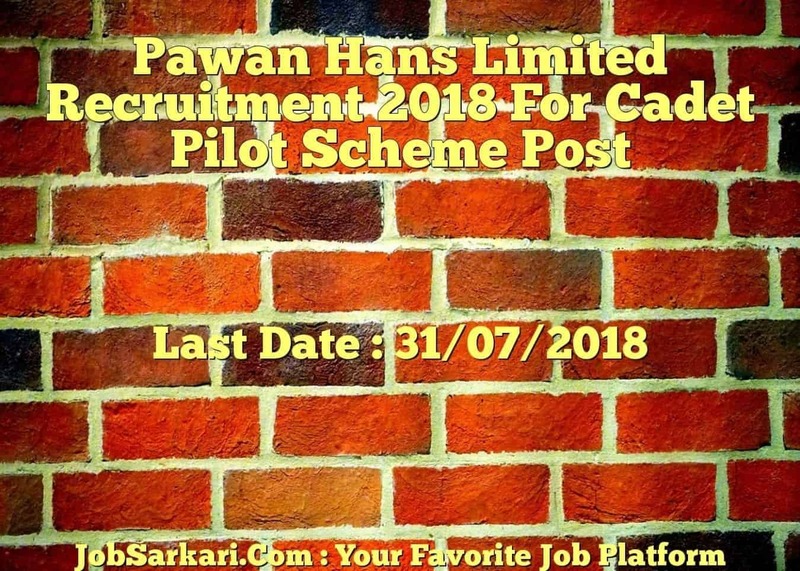 You can check Pawan Hans Limited - Pawan Hans Limited last date, download Pawan Hans Limited notification, visit Pawan Hans Limited official website and check other Pawan Hans Limited Vacancy details.Complete Vacancy and recruitment Details about 10 Cadet Pilot Scheme Post vacancies in Pawan Hans Limited are provided below by JobSarkari.Com only for you. Last Date of Receipt Application. 31/07/2018. Mode of Payment. Candidate Can Pay Through Demand Draft in The Favour of Pawan Hans Limited Payable At Noida/ Delhi. Cadet Pilot Scheme Candidate Must Have Passed Class 12th in Science With Physics, Mathematics And English With 60% Marks (55% For SC/ST). 10. 1. Candidate Need to Apply Through Online Mode Application. 2. Candidate Are Required to Click on Apply Online Link As Given on Our Website in Important Link Section. 3. Candidate Need to Fill All The Mandatory Details in Application Form And Take Out of Complete Application Form. 4. Candidate Have to Send All the Compulsory Documents Like Cast Certificate, Mark sheet, Address Proof and Passport size Photos As Prescribed Size And Format. 5. Candidate Need to Send the Application Form on Given Address Before 31st July 2018. Q. What is the Last Date For Pawan Hans Limited Cadet Pilot Scheme Post Vacancy ? A. 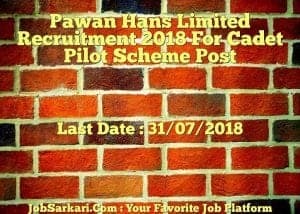 Last Date for Pawan Hans Limited Cadet Pilot Scheme Post Posts is 31/07/2018. Q. What is the Form Type of Pawan Hans Limited Cadet Pilot Scheme Post Recruitment ? A. The Form Type for Pawan Hans Limited Cadet Pilot Scheme Post Posts is Online. Q. How many vacancies are available in Pawan Hans Limited Cadet Pilot Scheme Post Posts ? A. There are about 10 Vacancies in Pawan Hans Limited Cadet Pilot Scheme Post Posts. Q. What is the Full Form of Pawan Hans Limited ? A. Full Form of Pawan Hans Limited is Pawan Hans Limited . Hi, If You Are Interested in this Job You Must Apply for this Job(If you Qualified to Apply), We Wish you All the Best for Future and Here is the Link to Apply for this Job.